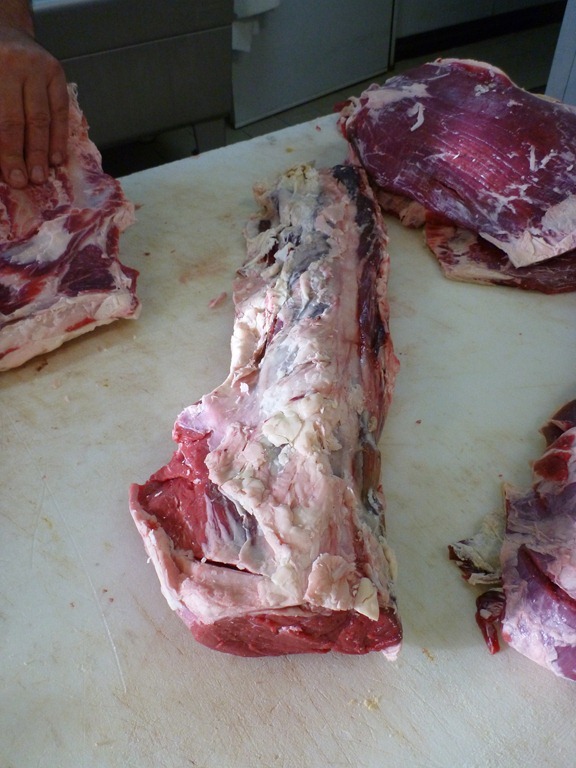 The latest animal at the butcher is a 30 month old heifer. This one finished a little more marbled than the last one, which I’d bet is more due to genetic differences than anything else. Splitting the entrecôte off from the faux-filet. One whole filet. This makes a very tender, but very expensive, roast. 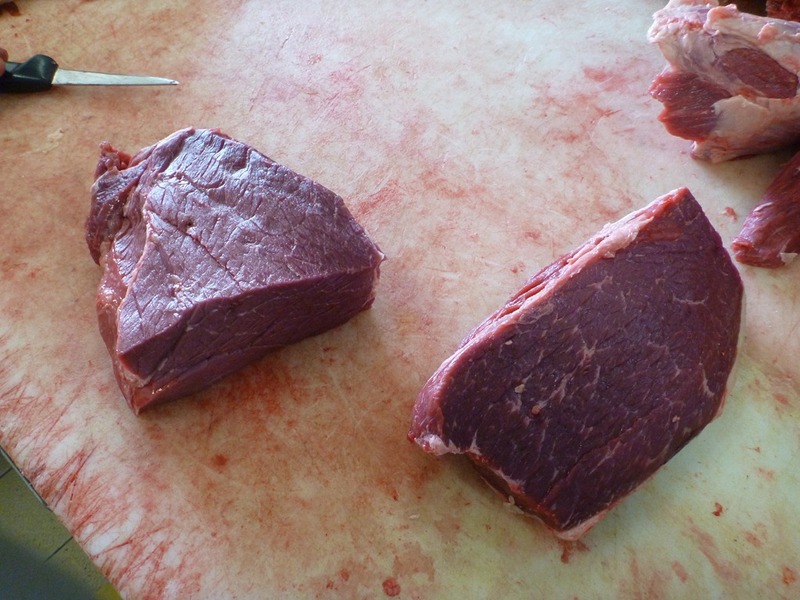 Below is what the filet looks like when turned into steaks. Remember, this is a pastured animal that ate only grass and our hay. It takes time and the right genetics to get marbling. 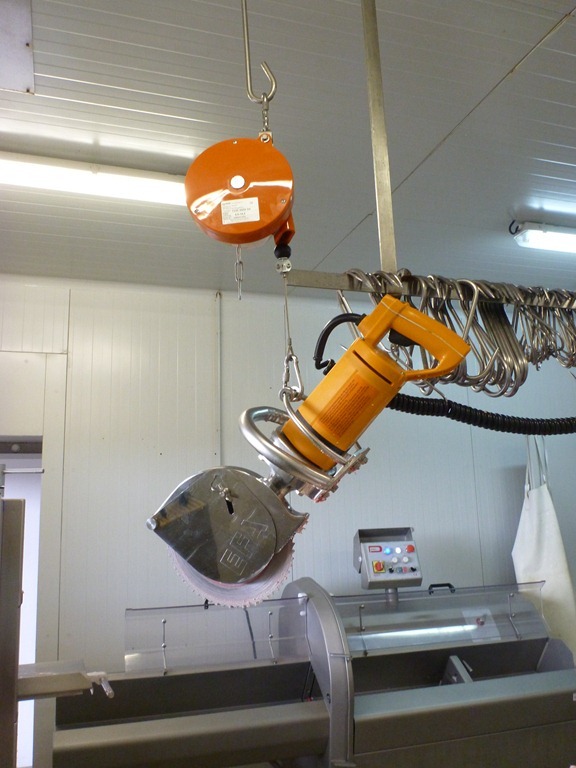 A cool industrial saw hanging on a retractable cable. 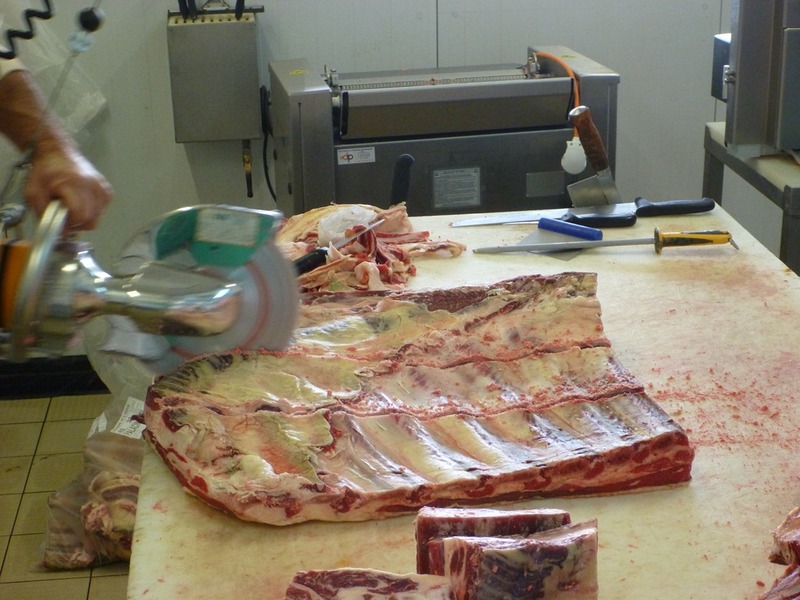 It cuts ribs in seconds. 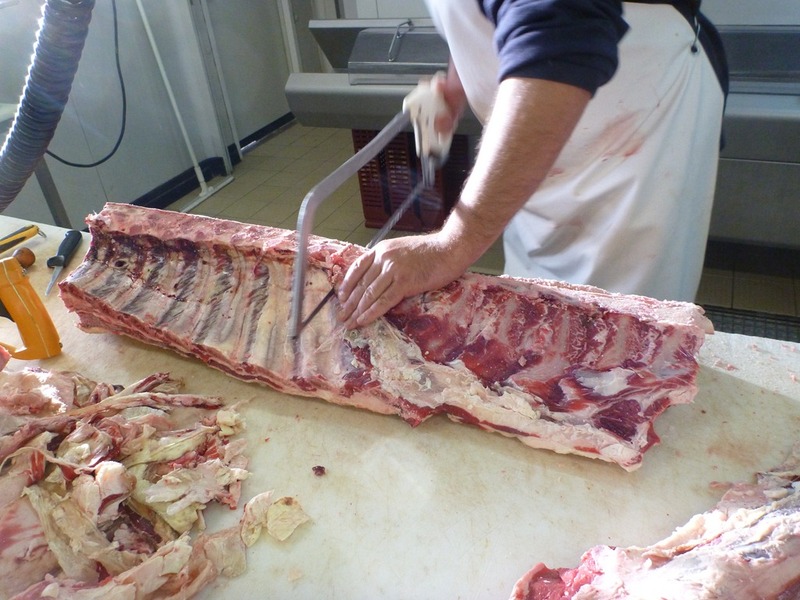 The French cut their ribs into short sections to make pot-au-feu. 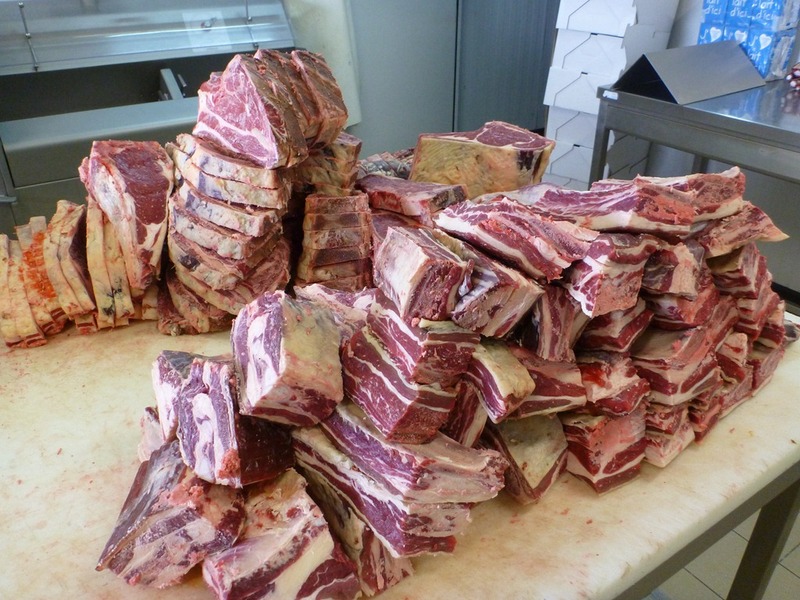 The foreground is a mountain of pot-au-feu ribs and the background is a mountain of fancy steaks. This leg of beef would not fit into the oven. Oxtail! One of my favorites. It makes a fine stew. 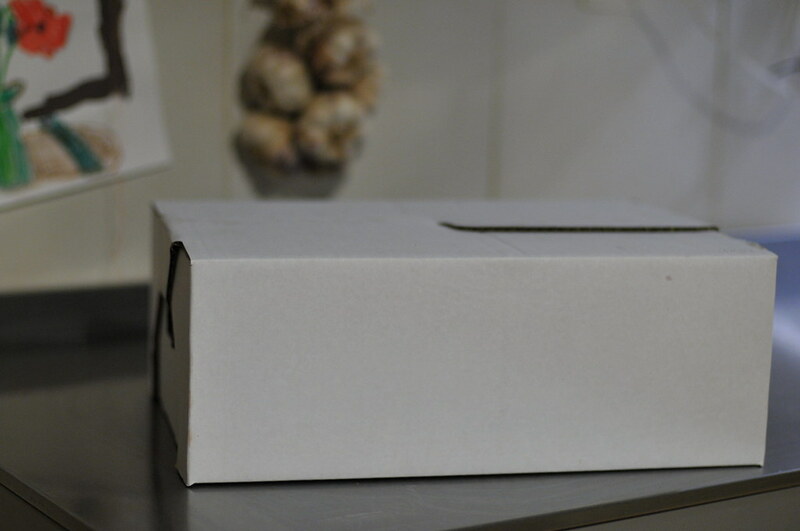 The salle de découpe with customer boxes stacked high. 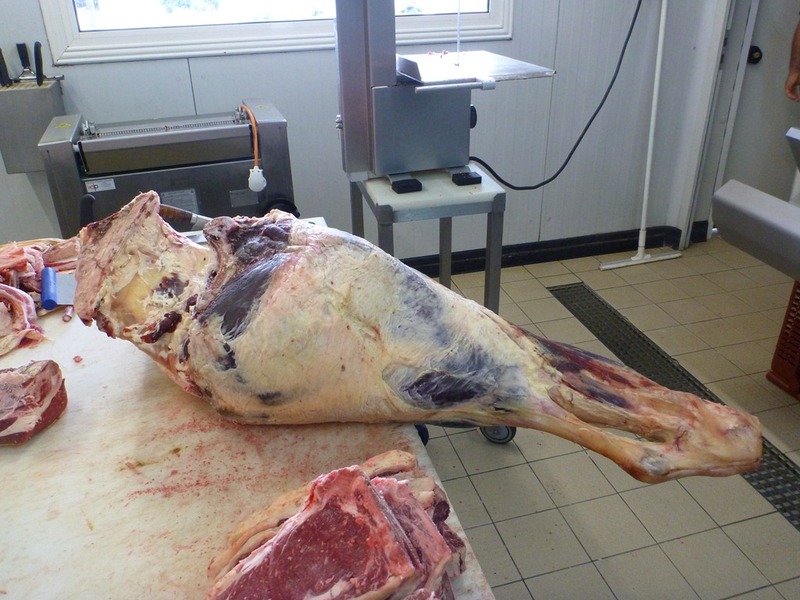 That 288.9kg for the carcass or about 637lb. The abattoir was at the town of Condom and the cow was a Salers. 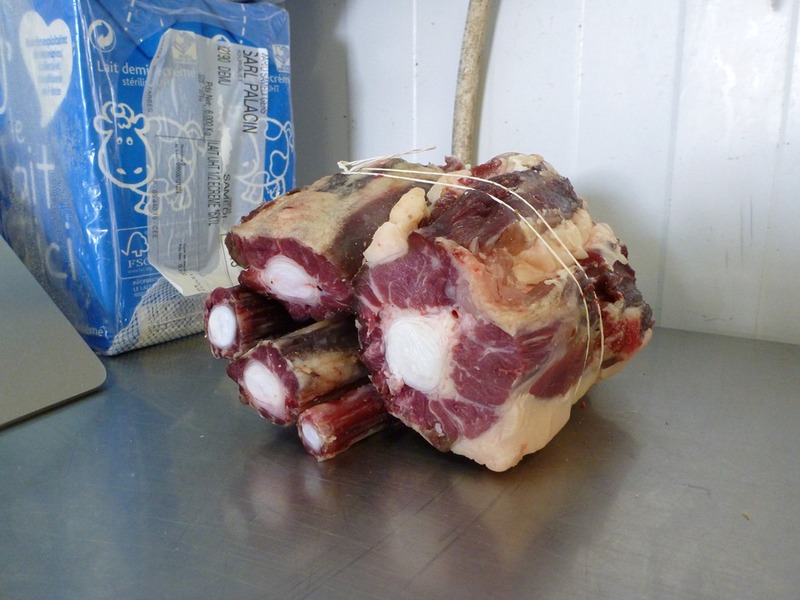 New for this round were some rump roasts. Each box had a roast. 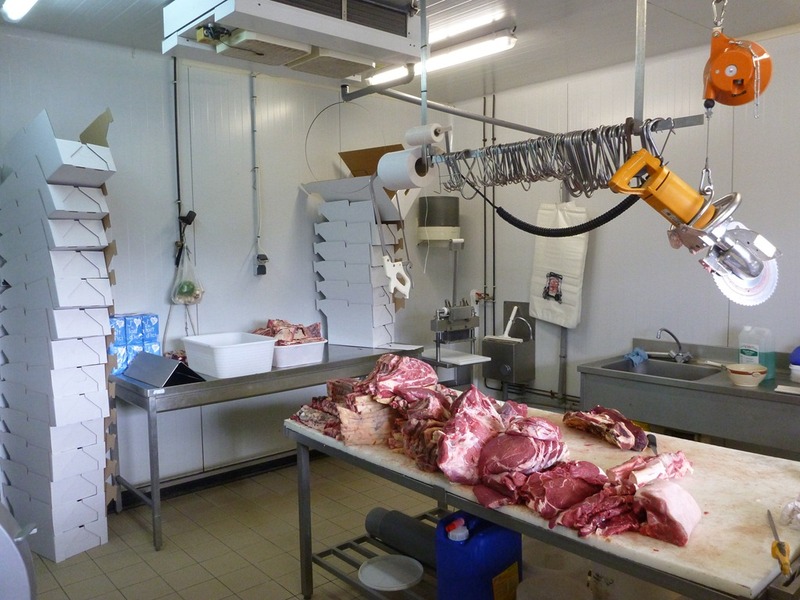 This butcher doesn’t do vacuum packing, although at some time in the future we’re going to try a packing company a little further away that does. Here’s what an entrecôte looks like while warming up waiting to be cooked. 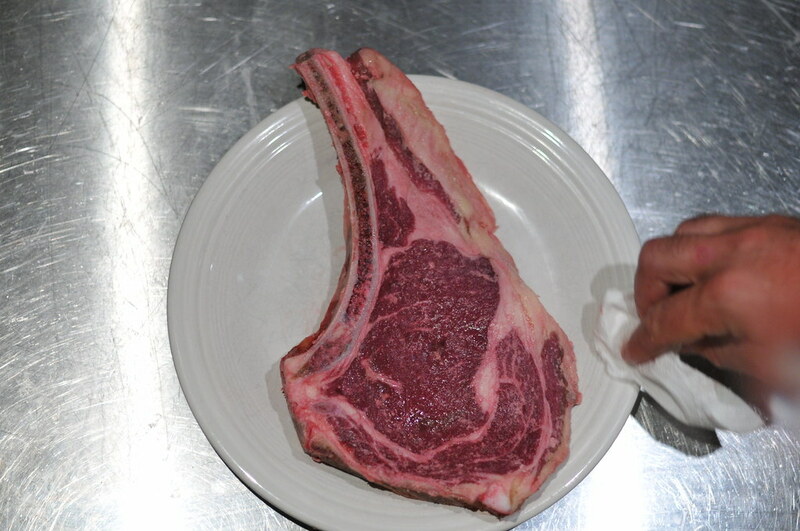 The best way to end a big day at the butcher’s is with a nice steak. The Agricultrix would consider wine essential. We had customers drive from four départements to pick up their beef. Bon appétit! Hello Shredster. I’d say organ meats are more popular than in America. Liver can be very expensive. Congratulations from me too! 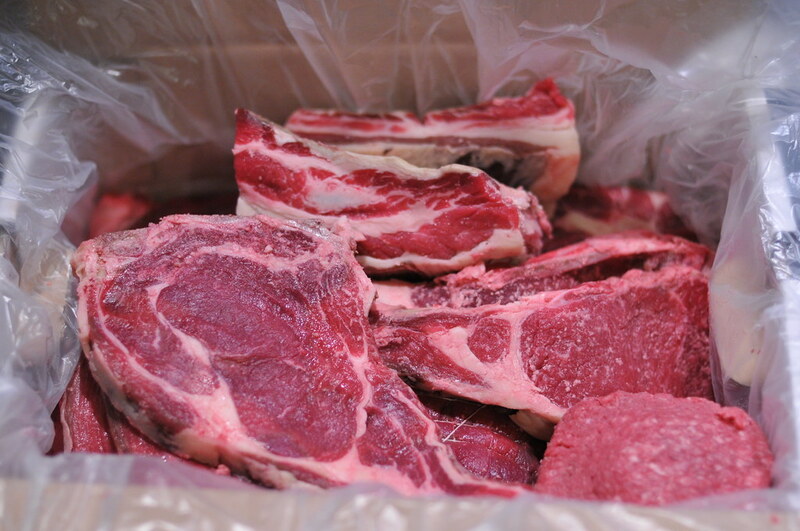 I’m still a bit surprised that people over there know what to do with a box of meat cuts like that especially with the bones. 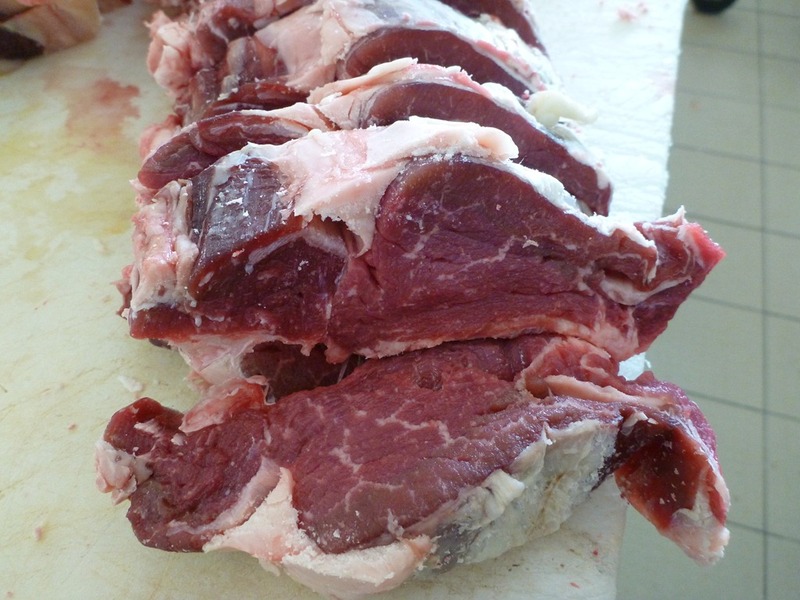 The rump roast’s the only immediately recognizable cut of them all, of what people usually eat that is. I don’t think I’ve ever seen the fat left on a filet in a shop. I’m not saying it makes sense at all. That’s some excellent beef! We’re eating a 30 month old heifer right now as well. They’re the best. Beautiful beef with great marbling! You can be proud! I can see why people drove from so far away for your beef. Very fine, and very good to see such quality of meat from your grass feeding regime, too.